VisualScript Studio lets you digitize a program increment board aligned with features in SAFe. It uses color to indicate relationships, just as you might use strings in traditional, analog planning sessions on whiteboards. This allows for better collaboration among remote team members and lets you execute your plan more efficiently. You can visualize the critical paths in your project easily using VisualScript Studio. Show the relationship of an issue with both an epic and with any dependent tasks found in Jira. The colors, column names, and line styles can easily be tweaked in the code. See tasks grouped by their impact and probability of causing a problem in real-time to make critical resource allocation decisions fast, and keep a sprint on track. This visualization created with VisualScript Studio uses a filter created for risks based on issue scoring fields and displays them as a Risk Matrix with color coding to help see potential problems at a glance. 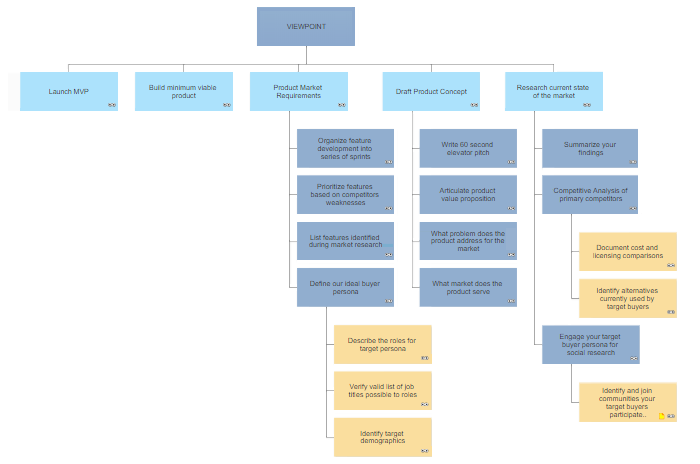 Show the hierarchy of a single project as a visual to reveal relationships and potential resource issues at a glance. Projects contain a set of epics, stories and sub-tasks that can be naturally organized and visualized in an org chart. Org charts are typically used to show a hierarchy of people in an organization, but its structure is also useful for depicting other forms of hierarchical information in DevOps.